Bollywood superstar Amitabh Bachchan has appeared as the highest tax-payer of the year from the film fraternity. Bachchan has left behind Salman Khan, Akshay Kumar and Shah Rukh Khan in the race to pay the highest tax. Mumbai: Bollywood is one industry that has all glitz and glamour as well as money and power. They are the people who enjoyed the utmost luxury life in India with fancy comforts. So, it is evident that they earn a significant amount of money through their work every year with every project they do. However, the more you earn, the more taxes you have to pay too. Some of the other highest tax payers in Bollywood are Karan Johar, Shah Rukh Khan and the likes. So, prepare to be shocked. 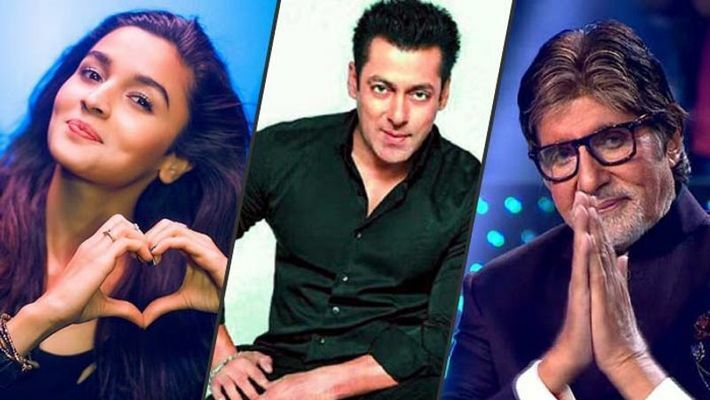 Here is the list of Bollywood celebs who paid a staggering amount of money as tax. According to DNA, the Shehenshah of Bollywood, Amitabh Bachchan has paid Rs 70 crore as tax for the financial year 2018-19. He has emerged as the highest tax-payer of the year from the film fraternity. Bachchan has left behind Salman Khan, Akshay Kumar and Shah Rukh Khan in the race to pay the highest tax. Not to forget that recently, Bachchan had paid off loans of 2,084 farmers in Muzaffarpur and had also donated Rs 10 lakh to the family February 14 Pulwama terror attack victims. Last year Salman Khan had emerged as the highest taxpayer with an advance tax payment of Rs 44.5 crore. Prior to him, Akshay Kumar had paid the highest advance tax of Rs 29.5 crore in 2017. We did not see much of Ranbir Kapoor this year or last year. So the tax he paid was Rs 16.5 crore, while in the previous year the amount was Rs 22.3 crore. Also, his sister Kareena Kapoor income decreased by 44% last year. This also reduced the amount that she had to pay as tax, which is Rs 3.9. On the other hand, Ranbir's girlfriend Alia Bhatt is on the list of highest tax payers of Bollywood. In the previous year, she paid Rs 2.9 Crore as the tax. While in this year, she paid Rs 4.33 crore as tax. Akshay Kumar income decreased this financial year slightly that effect was seen on the tax. He paid Rs 29.5 crore as tax. Salman Khan just gave Katrina Kaif a super expensive gift worth Rs 2 crore. Can you guess what it is?